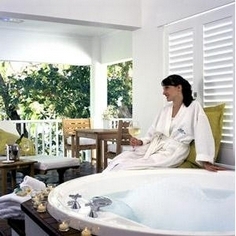 The Reef House Boutique Resort & Spa is a boutique beachfront resort with a sophisticated yet relaxed atmosphere. 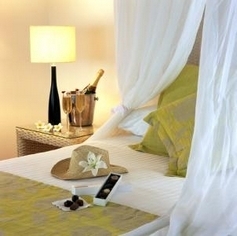 Perfectly positioned in the heart of Palm Cove and just 20 minutes from Cairns International Airport, the resort is just steps away from the white sandy shores of the Coral Sea and the perfect place for a short trip, honeymoon or a romantic weekend getaway. The Reef House Boutique Resort & Spa is situated amongst tranquil tropical gardens and ancient towering paperbark trees. The colonial-style architecture is designed to capture the romance of the tropics and the charm of a bygone era. Candle-lit corridors and fresh white washed walls give way to three pristine pools and two spas. The award winning Reef House Restaurant offers a superb dining experience with unsurpassed ocean views, while the poolside cafe is the perfect spot to enjoy a light snack, meal, or cocktail beside the hotels freshwater pool, shaded by palm trees, rambling bougainvillea and a cascading waterfall. Previously a VIP guesthouse owned by Army Brigadier David Thompson, The Reef House Boutique Resort & Spa has maintained its history and traditions throughout the years. Every evening candles are lit around the resort at sundown and guests gather to share their stories over a complimentary glass of Brigadiers Punch. The resort also boasts the only true honour bar on mainland Australia, similar to an Officers Mess from yesteryear. The 69 spacious rooms and suites were luxuriously refurbished in 2007. Whilst maintaining their colonial charm. All rooms and suites feature oversize beds draped in light muslin netting, warm teak furniture and wide verandahs to ensure guests are given an experience, not just a room. Some rooms also offer private Jacuzzis and twin bedding is also available upon request. Nightly turndown service, complimentary book and board game library and exceptional service are just some of the additional features that we offer at The Reef House Boutique Resort & Spa to ensure your stay is memorable. 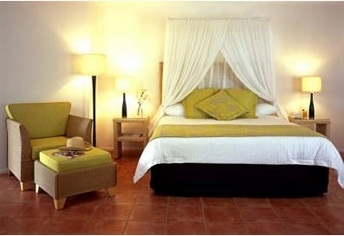 Accommodation in a Brigadier Room offering resort style accommodation with a Colonial feel. Enjoy Complimentary Twighlight Brigadier Punch in the evening. To reduce the effect on the environment the Stay Green room does not include a daily service. The Reef House Boutique Resort & Spa is perfect for the small conference and incentive. Our conference room can cater for up to 25 people in a spacious area. As there is only ever one conference on the property you will also have exclusive access to our many breakout areas. These include a tropical garden terrace, a courtyard and also our Poolside Cafe. The conference room is fully equipped with modem/fax lines, TV/DVD/Stereo, Whiteboard etc. Other equipment can be arranged on request. Clients who use the conference room find it refreshingly different to other hotels. The room has an open feel and is bathed in natural light. The Reef House Boutique Resort & Spa has the adaptability to prepare a large range of meals for conferences, from simple sandwiches to lavish banquets. Whatever you choose you can be rest assured delegates will walk away more than satisfied. It's the perfect small meeting retreat. Our intimate casual surrounds and breakout space is available for your exclusive use. Airport transfers can be arranged at a cost of $22.00 per person. Flight details need to be provided at least 48 hours prior to arrival. From Cairns airport, turn right onto the Captain Cook Highway and follow for approx 20 mins. Just after Wild World the Tropical Zoo, turn right onto Vievers Road. Follow this road to the end, then turn left onto Williams Esplanade. Palm Cove Village - where the rainforest meets the sea where the white sands beckon and the palm trees sway in the tropical breeze where the everyday ends and the extraordinary begins. Just twenty minutes north of Cairns International Airport, cosmopolitan Palm Cove Village is ideally located for exploring the magical attractions of Tropical North Queensland. Set sail for the colourful coral gardens of the Great Barrier Reef directly from Palm Cove jetty. Take a journey through the ancient rainforests of the Daintree and Cape Tribulation. Head for the hills and the natural wonders of the Atherton Tablelands. Enjoy a round of golf on a Master's standard course. Get your ticket to adventure with white-water rafting or a 4WD safari. Or simply relax on our palm-fringed beach and contemplate the Coral Sea. Close to Palm Cove, there's so much to see and do that the hardest part of your holiday could be deciding what not to do. And in the Village itself - where no building is higher than the coconut palms - you'll find restaurants, village shopping, bars and cafes. Our resident tour specialist, Colin Benn can make all the arrangements for hire cars and tours. He has the local knowledge, so please email Colin for all tour enquiries or bookings.